Everyone wants to get their hands on the ring from Lord of the Rings and now you can own this ring (or will the ring own you?). From Sauron to the kings, from Bilbo to Frodo and back to Mount Doom, this ring “The One” has captured the desires of all. Made from high-quality tungsten, this ring is scratch and won’t tarnish or fade. Don’t settle for cheap imitations, this ring is comfortable to wear and has a smooth, rounded surface. 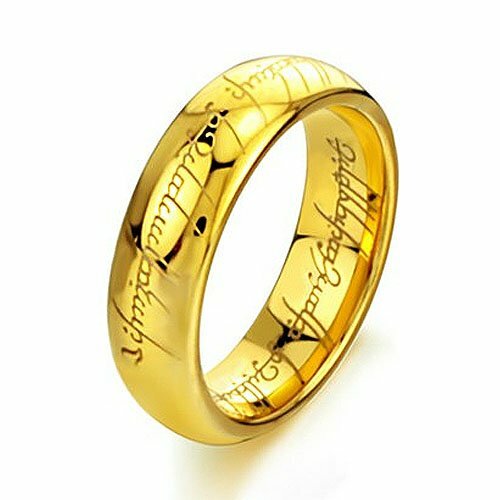 Of all the Lord of the Ring Rings, this one has the highest reviews on the internet. You can buy this one with confidence. 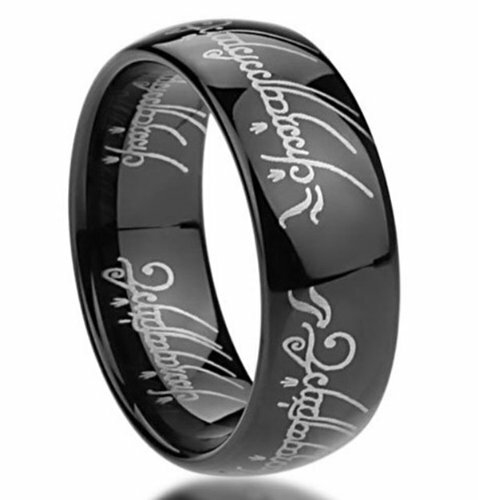 Another beautiful variation of the ring from the Lord of the Rings is this black tungsten carbide ring. The ring comes in sizes 7 -14 and includes half sizes as well. 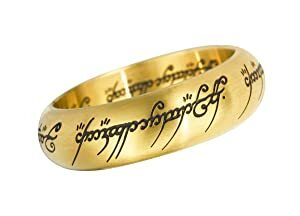 The Elven description is laser etched into this ring. Make sure to visit here to read a great history of the Lord of the Rings Ring. 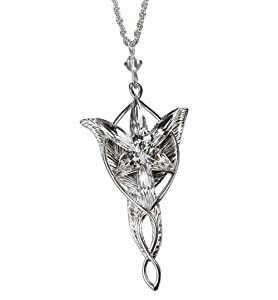 Arwen Evenstar, the half-elven daughter of Elrond, wore this beautiful pendant. It is sterling silver and comes with a 18″ sterling silver chain. Made in the U.S.A, this dazzling pendant is officially authorized by Warner Brothers. This pendant is scale to size measuring in at a full length of 2 1/2 inches. Galadriel’s Ring also know as the Ring of Water. 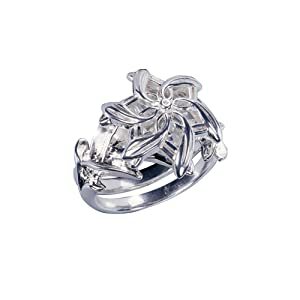 The Queen of the Elves, also referred to in the Fellowship of the Ring as Nenya wears this beautiful ring. Masterly crafted in Sterling Silver and set with a European crystal, this U.S.A made ring is the official Warner Brothers authorized release. Comes with a wooden collectors box. The leaf pendant can be worn as a necklace or a brooch with the attached pin on the back. This scale pendant is 2.5″ by 1.75″ so you are not getting a small replica. 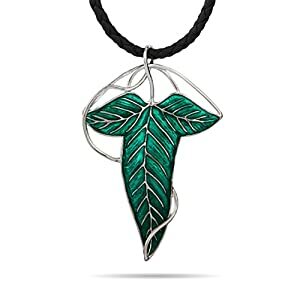 Created in Sterling Silver, the leaf pendant/brooch comes with a 16″ or 18″ cord. Stainless Steel Craftsmanship with a laser etched Elven inscription, these Lord of the Rings Earrings are sure to be a conversation starter. 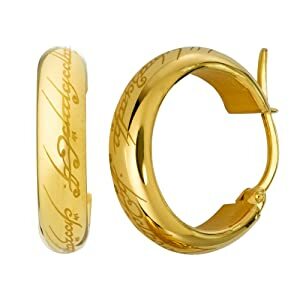 A perfect size of 3/4″ diameter keeps these earrings classy but large enough to be noticed.